You have been facilitating a particular frequency for the rest of humanity. You who are awakened enough to receive this transmission have been tuning yourselves to higher frequencies when you are asleep, and you have been bringing back the essence of those frequencies when you wake up in the morning. You are beginning to experience them in your waking state, and you are doing so for the purpose of sending out a signal to the rest of humanity. You are essentially telling your fellow humans that you are available to them when they have questions about what they are going through. There are people who are having very strange dreams. There are people who are having extra-terrestrial encounters. There are people who are having strange ascension symptoms. There are people who are experiencing what it is like to have a wide open third eye, and there are people who are hearing a voice in their head. And these are just a few of the experiences that people have and don’t know anything about. There are people who are awakening in communities where they will be the only one who has a new age, or spiritual, orientation. They are looking for you. You are sending out this particular frequency to them so that they will recognize you in the grocery store, the post office, the bank, or at the PTA meeting. You are helping by being willing to be who you are in spite of the fact that you are very different. Some of you could be institutionalized, if they knew what you believed in, specifically. It all does sound very crazy to the average person. And so, you can imagine what happens inside the head of the average person when they begin to experience these awakenings. They need support there on the ground floor. They need others who will be able to not only relate to them, but also who can explain to them what they are experiencing, why, and who can also tell them that it’s perfectly normal. You are leading the surge forward for humanity in terms of the consciousness that humanity can hold as a collective, and it is a big responsibility. And you can expect more and more people to come looking for you, not only because of how you dress, or the things you say, but also because of this frequency that you are beginning to send out. 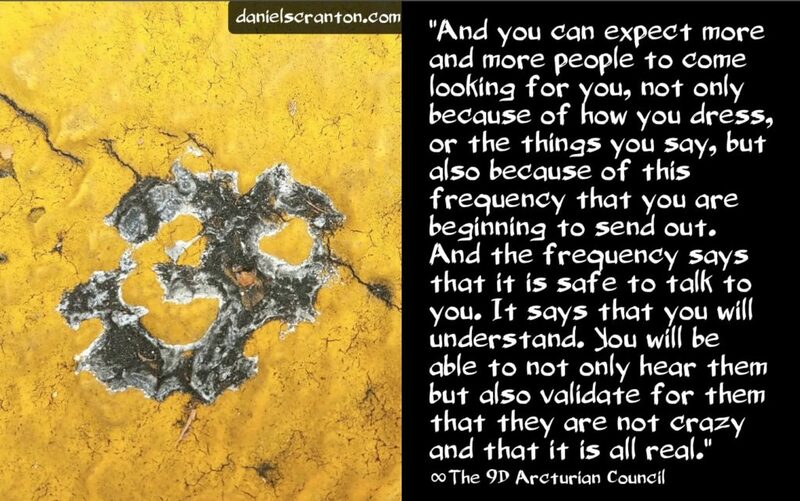 And the frequency says that it is safe to talk to you. It says that you will understand. You will be able to not only hear them but also validate for them that they are not crazy and that it is all real. So what can you do to help facilitate this process? Well, it is quite easy. All you have to do is keep being who you are, believing what you believe, and get a good night’s sleep.